Sheurebe (pronounced “Shoy-ray-bah” ) is a white German Vitis Vinifera resulting from a cross of Riesling with Silvaner. The goal was to create a superior Sylvaner. It is grown mainly in Austria and Germany (and now in Nova Scotia!) and, like Riesling, makes a range of balanced wine styles; from sweet to dry. 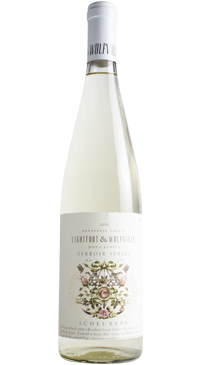 This is the first release of Lightfoot & Wolfville’s Terroir Series Scheurebe; the organic and biodynamic grapes were hand harvested from the Oak Island vineyard in Avonport, NS before macerating on the skins for about 20 hours in order to extract the right amount of aromatics and structure from the skins wile still maintaining the wine’s elegance and lightness. Fermentation in cool stainless steel to preserve the fresh, primary fruit flavours. This wine is light bodied and fresh at 9% alcohol, but is big on aromatics and focused flavours of guava, passionfruit, lychee, and ginger. The residual sweetness is comepletly in check to create a balanced wine. Enjoy this with Thai food with citrus & chilies or any dishes that feature fresh ginger root. 2017 Atlantic Canadian Wine Awards.